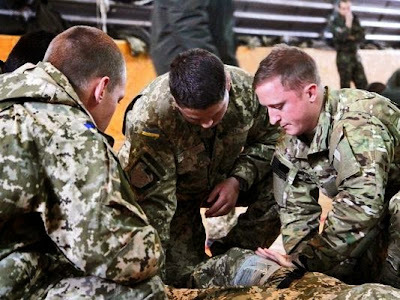 KHMELNYTSKYI, Ukraine -- About a dozen medical specialists from Special Operations Command Europe deployed earlier this week to Western Ukraine to coach Ukrainian soldiers on basic battlefield medical procedures, European Command officials announced Friday. An Air Force Special Operations medical officer from U.S. Special Operations Command Europe demonstrates how to apply a tourniquet and bandage a wound to Ukrainian soldiers Tuesday in Khmelnytskyi, Ukraine. The announcement comes the same day the White House released a statement honoring the memory of millions of Ukrainians starved to death during the "Holodomor," between 1932 and 1933 under Stalin's regime. The SOCEUR team from Stuttgart, Germany, deployed to support nearly 600 Ministry of Defence personnel and in response to Ukrainian government requests, according to a statement from U.S. European Command spokesman Navy Capt. Greg Hicks. Assessments over the last several months identified a need for enhanced individual medical capabilities, the statement said. "This initial mission will take no more than 30 days but we are prepared to stay longer if directed based on the need for additional courses as identified by the Ukrainian Government/Military," EUCOM spokesman Lt. Col. David Westover told Military Times. "This is another example of the U.S. Government supporting the Ukrainian Government and our partners in the region as a part of Operation Atlantic Resolve," he said in an email. SOCEUR members are also working with the nongovernment organization Patriot Defense, which has conducted similar coaching for Ukrainian military forces since May. On Thursday, the United Nations said that the death rate in Ukraine has climbed in the past eight weeks despite a ceasefire called in September, according to a report from Reuters. More than 4,400 fighters and civilians have died since pro-Russian rebels began taking control of border areas in early April. SOCEUR is comprised of the Army 1st Battalion, 10th Special Forces Group (Airborne); the Air Force 352nd Special Operations Group; and Naval Special Warfare Unit 2, according to European Command's website.